Get great deals on our clearance laminators and equipment. You'll save hundreds on the demo, refurbished, and used machines we have in stock. All items labeled open box come with the full manufacturer's warranty. Most people are familiar with the concept of a laminator. When purchasing one, the first thing you’ll need to do is determine if you need a pouch or roll laminator. Pouch laminators use laminating pouches; you place your materials inside and send the entire thing through the laminator. Roll laminators use two rolls of film, one for each side. Items are fed into the machine with one roll of film coating each side and sealing on the edges. Let’s look a little closer at each style. Pouch laminators are best for smaller items. Things like ID cards, business cards, tags, and badges are all protected with the use of a pouch laminator. These machines come as small as a simple ID card (four inches) up to a medium sized machine capable of handling letter and legal sized documents. Larger pouch laminators are able to handle expanded sizes, such as a restaurant menu or a small poster. As stated, pouch laminators use laminate pouches. Place your documents in and feed the entire unit into the machine. As it cycles through, the heat seals the edges as well as melts the whole surface onto the page between the layers. Materials inside are essentially locked in and cannot be retrieved without considerable damage to the contents. Pouch laminators use rollers to move the laminate through and come with two, four, or six rollers depending on the size of the machine. Top pouch laminator brands include GBC, Fellowes, Akiles, Tamerica, and Lamitek. Roll laminators are much larger machines designed to handle higher capacity laminating needs. Two rolls of film are positioned on the rear of the unit and paper is fed inbetween the rolls. As the rollers begin to move the film, materials are pulled in as well and the heat seals the edges and melts the laminate onto your pages. These larger devices are most often seen in schools, larger offices, commercial print shops, and the like. They can handle any size job but are made specifically for larger items, such as posters, maps, and more. When determining which one to buy, make sure it can accommodate the largest size document you think you’ll need to laminate on a regular basis. There are a few designed for frequent use with smaller items. Because of their larger size, roll laminators can be quite a bit more expensive than pouch laminators. Be sure that you actually need the added capacity before making your selection. A third option is becoming increasingly popular and that is cold laminators. The cold process uses pressure activated adhesive rather than heat. A few cold laminators don’t even require power to work, they run on either battery or pressure alone. This makes them ideal for using anywhere you might need to. And since they don’t use heat, they are safer to use around children and pets than traditional heated laminators. Within any of these options, there are a few things you’ll want to take note of before purchasing. Does your machine have a reverse function? This would allow you to extract documents in the middle of the laminating process. Checking on the warranty is always a good idea. Laminators don’t often have very long warranties, so even 90 day coverage is a bonus. And as mentioned earlier, consider the size of the documents you plan to laminate on a regular basis and choose a machine slightly wider. This will ensure that your materials have enough room to pass through with extra on the sides for the laminate to seal. Now all that’s left is to find the right laminator, film, and get started! Welcome to MyBinding video. This video is designed to give you a little insight into the world of laminators, both roll and pouch. Pouch laminators are extremely popular and very easy to use. They use plastic pouches that you put your materials in and then inserts into the machine. They can be very small for little applications, like photos or name badges, or oversized, allowing for posters, double documents and full-sized sheets of paper. Many of them are within the 9 to 12 inches, allowing for standard and legal documents. While many laminators can do many things, some are really specifically built for special applications, like photo work or foil laminating. Pouch laminators require a pouch for everything that you laminate, and pouches themselves come in different sizes as well as thicknesses. Every laminator is limited by size and thickness. You want to make sure that your laminator will work with your needs. You want to also consider your work environment -- is it consumer? Is it home? Is it school? Is it industrial? -- because different machines can handle different capacities. Some of them are quite simple; they work great but can't be pushed too hard. Some of them are industrial strength. They're fast, they're hot and they can move a lot of documents through in a quick time. And finally there are the issues of workability and flexibility. A single application done over and over does not require much versatility, but most users need to have the flexibility of different sizes, different weights and different temperatures. So pay attention to knobs, dials, settings and ways that you can change so that you can get things done with the machine you purchased. The second large family of laminators are roll laminators. Some require heat and some do not. These do not use pouches but laminating rolls. There should be two separate rolls that, when pressed together, make the laminating happen. Generally, smaller roll laminators are done by hand. Larger, more industrial size or school-size laminators tend to use heat and work automatically. They're more difficult to set up. When everything is in place, they can move a lot of product. As you can see here, these larger roll laminators can handle the largest of projects and process them one right after another after another. 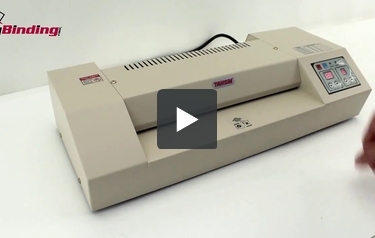 We hope this video has been helpful to understand laminators a little better. Your price is going to range from the size to need to application and the amount of productivity that you need. For more demos, reviews and how-tos, check out MyBinding.com.